Abdul Amir is a character in the HD Universe who appears as a minor character in The Ballad of Gay Tony. Abdul Amir was born in Dubai, United Arab Emirates in 1950 and in 1977, at the age of twenty-seven, had a son Yusuf Amir. A highly conservative businessman, Abdul made his fortune in real estate development with Yusuf spending his life attempting to impress his father. 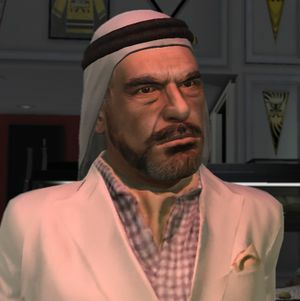 Yusuf also becomes involved in real estate development but later moves to Liberty City in the United States of America. In 2008, Abdul visits his son and is disappointed with the way he lives; with guns, drugs, prostitutes and most importantly, no pants. By the end of his visit, Abdul becomes interested in franchising Gay Tony's clubs. Abdul Amir's manner of attire is similar to what many in the Middle East may practice; while donning a white Western suit, Mr. Amir is also depicted wearing a more traditional keffiyeh headdress complete with an agal.